As I was just checking on the shares for my last blog post, I realized someone had Pocketed my post. I thought- how exciting, someone wants to read ME later- I love Pocket. and it’s a great way to save blog posts you find online for later. iPad/iPhone app- awesome for reading on the go- know a head of time this can take a lot of space though 250MB for me, but you get to read things offline (there are settings to turn this off). (I like the list format because I can read through it quickly). It’s free, I can tag articles and read them from archives and it makes it easier to stay on top of must read posts. Did I mention FREE? They have a paid plan where you can get secured backups of your posts as well. It also works with IFTTT to automate sharing, etc. Do you leave your social media profiles open in tabs and keep referring back to them for mentions, comments, etc? It’s not exactly the most productive way to stay on top of alerts, but Chime is. Chime allows you to sign into your accounts and get notifications right inside Chrome- little pop ups in the top corner that tell you what is going on and where. Now you can save time running back to check on every platform and just respond when you need to.This is the drop down of notifications that is also available in Chime (right in the browser). is the place to keep track of your favorite RSS subscriptions. It’s basically the best tool in the world for a blogger who wants to stay on top of other blogs. There are actually more integrations than I understand as I don’t even know what a few of these icons stand for. What I like most about Feedly is I can easily send it to my favorite tools without a hassle. Initially I loved it for the integration with BufferApp, but lately I had gotten annoyed with the speed at which Buffer works. Is it just me or does it lag? With that in mind I went to see if I could add a tag and quickly tag articles to be queued to my Buffer account through IFTTT. And the answer is YES!! This means I click the article title, skim it for quality, click tag, select Buffer and bam it’s in my Buffer account. 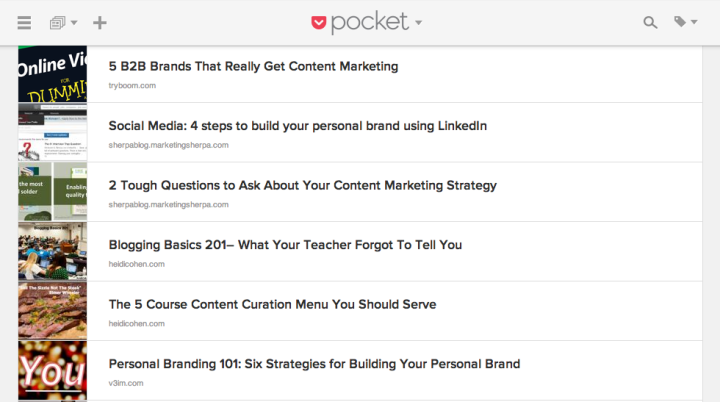 Pocket can make it a lot easier to stay on top of your reading. Email gets overwhelming because of all of the types of messages you get so I don’t like to keep good posts there. I click through and hit Pocket.Chime is not really a blogging tool but it is a social tool that helps me stay on top of when people are sharing my posts on Twitter or need me in social.IFTTT is great once you have a use for it, or understand how much it can help. There are tons of recipes but you really have to figure out what problem they solve, for me it was the slow moving BufferApp extension in Chrome. Thank you for great tips Mary. One question. Chime seems to do on Chrome on your desktop what HootSuite does on all my devices. What are the benefits of Chime, since it has (for me) the huge downside of being limited to desktop? 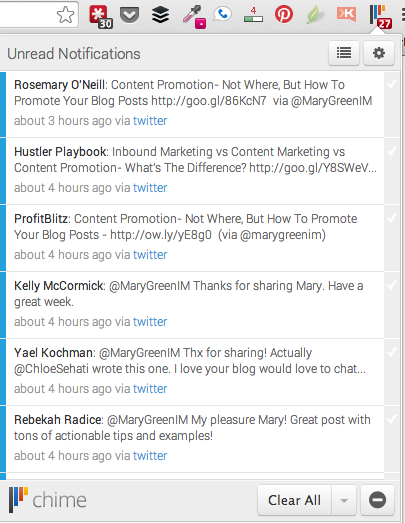 I haven’t used that side of Hootsuite before to get notifications on the Desktop- how does it provide that functionality? I know it can help on mobile and that is useful. I like Chime because it has a do not disturb option as well. Glad you like them, what other recipes do you use on IFTTT?